Inspired by the fascinating talk by Hans Summers I mentioned recently, I ordered a QCX transceiver kit with filter for 20m. 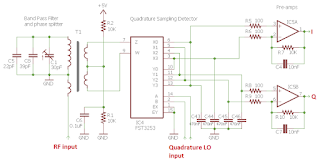 Hans criticised the continued use of the obsolete NE602 based QRP transceiver design in the light of more modern and better performing quadrature detectors based on clever programming of the Si5351 clock generator. 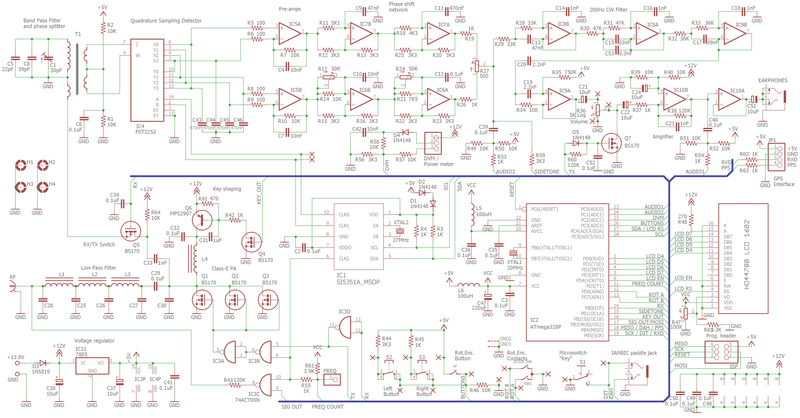 QRP Labs, Hans' company has published an excellent paper that accompanies that talk. For US$49 you get amazing value. 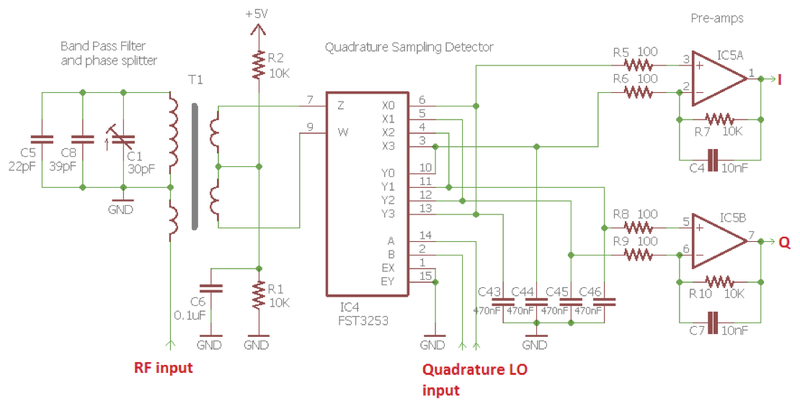 The quadrature sampling detector is shown here (reproduced from the paper which is well worth a thorough read). Here's the full circuit. The board has the surface mount ICs already soldered as you see above and the components are neatly bagged up. My kit was missing the plastic screws which is no big deal. 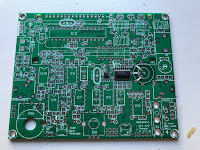 My board was revision 4 and unfortunately the assembly manual hasn't been updated yet. The instructions are very clear and detailed. I mis-installed a few resistors, completely my fault, but easy to do. Colour codes are hard to read sometimes. 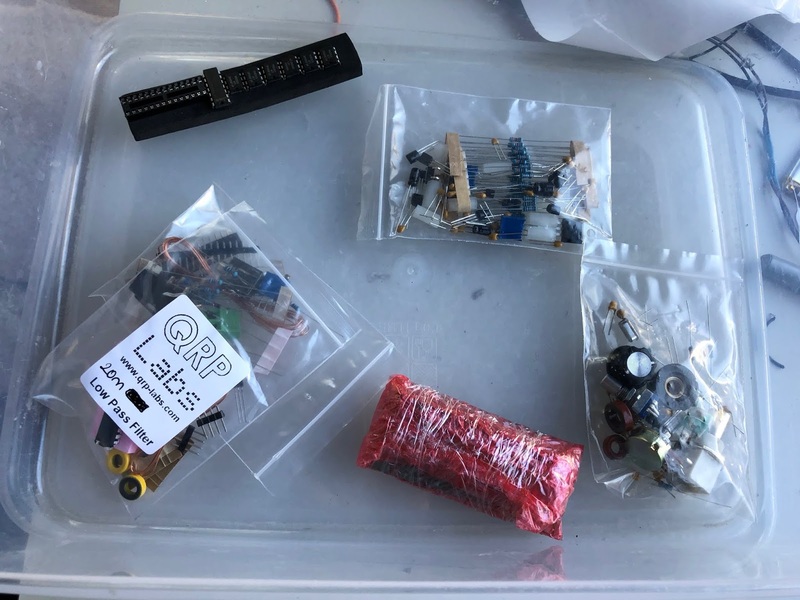 The most challenging part of the build is the T1 Toroid transformer with 4 windings but Hans has included a diagram from a third party that makes it quite clear. The software is fantastic with a menu driven system that includes built-in alignment circuitry that is magical! 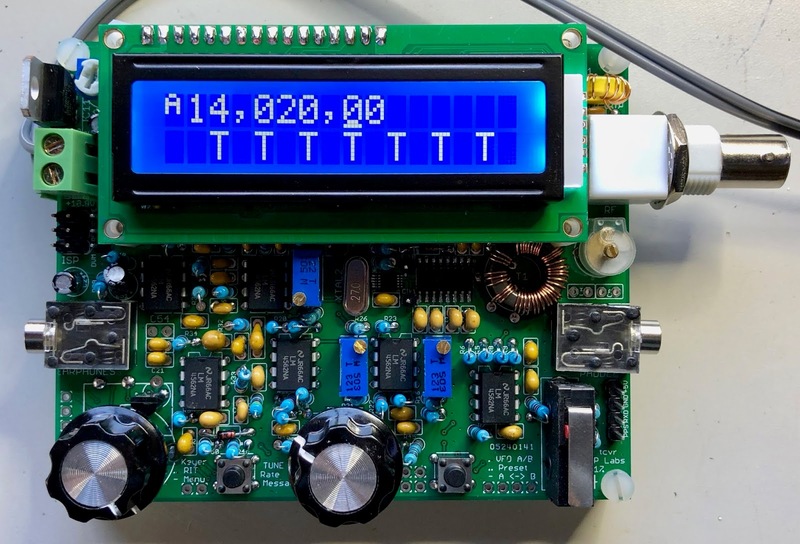 With no antenna connected, test signals are generated and measured with multi-range bar graphs so that the front end band pass filter can be peaked, I-Q balanced, and 90-degree phase shift can be adjusted for high and low frequencies. (Note that these last three interact so you have to rock between them to optimise). 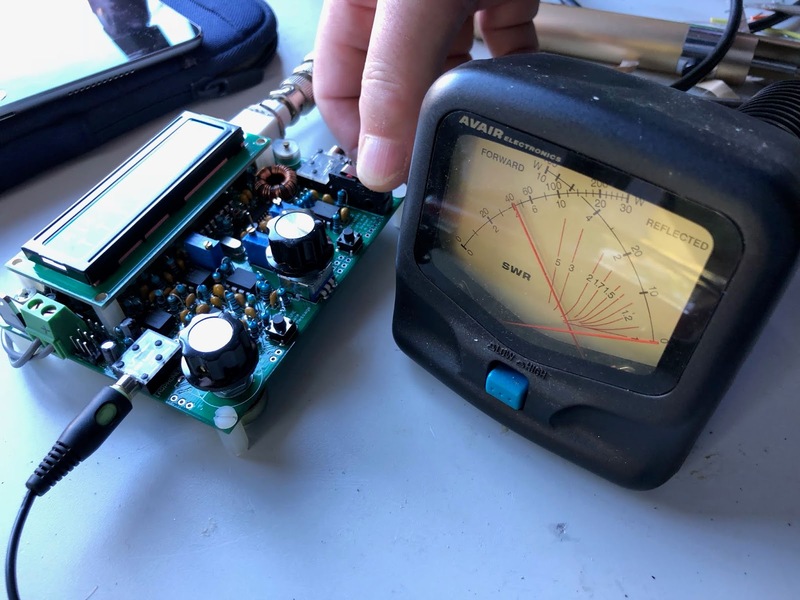 I'm getting about 4W out on 20m with a 13.8V supply. 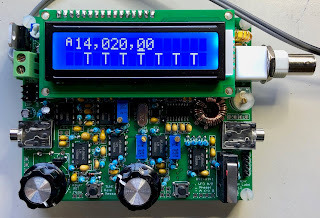 The RF out stage is three BS170 FETs running in class E and it's amazing to see a few small transistors producing this power without excessive heating. 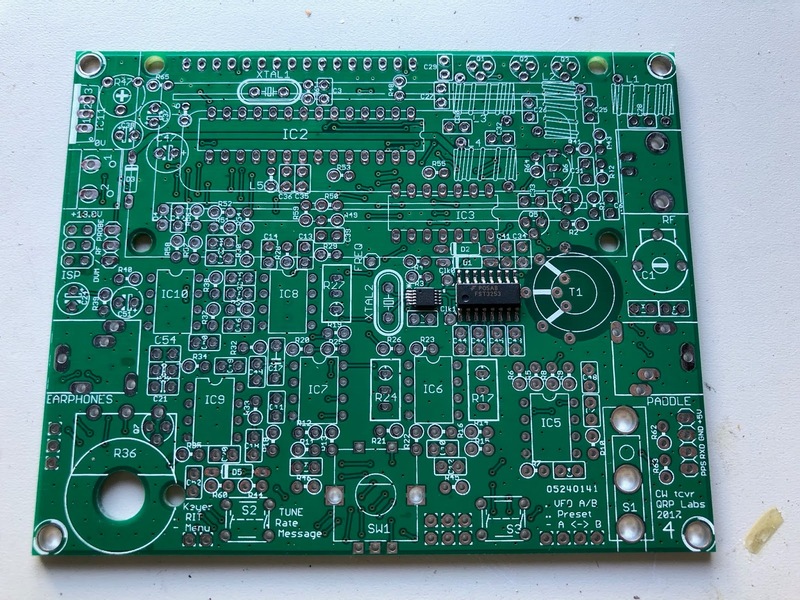 I enjoyed building this kit, it's great value, but care is needed as it's quite difficult to remove components from the dense board. 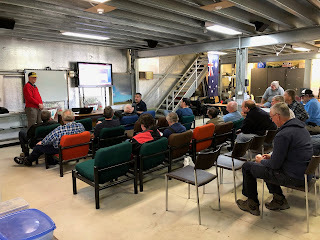 Today was the ARNSW home brew group meeting. I passed the QCX around along with the circuit diagram which attracted quite a bit of interest. Tuning around 20m this afternoon I found the CW decoder works amazingly well. This is a 200Hz bandwidth CW receiver but I'm able to listen to SSB, although it's rather too narrow. I hope QRP-Labs does go on to make an SSB unit based on a similar design.